Bear with me while I title this brief presentation "The Love of Four Kernels." The title might bring to the minds of lovers of classical music the title of Sergei Prokofiev’s opera known in English as The Love of Three Oranges. That satiric opera tells the story of the prince who is sent in search of three oranges, one of which contains the seeds of a beautiful princess. Fans of the English stage may recall Peter Ustinov’s comedy titled The Love of Four Colonels, about four officers – Russian, French, English, American – who romance four women of different nationalities. Readers of the writings of Northrop Frye will know what I mean when I refer to The Love of Four Kernels. 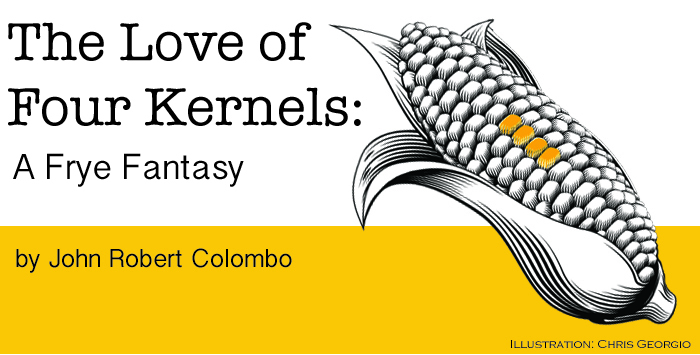 They may not know about "the love," but they will appreciate the meaning of "four kernels." What comes immediately to mind is the image of those orange-coloured kernels of popcorn, which, when heated, pop and produce mounds of edible, fluffy white popcorn! We identify boxes and mounds of popcorn with Saturday-afternoon movie matinees of the past and today’s "home theatres," especially Orville Redenbacher’s brand. (In typing out the first draft of these notes, I inadvertently called the brand "Colonel" Redenbacher’s popcorn, confusing the popcorn maker with Colonel Saunders, the chicken man.) Such is the staying power (or the straying power) of the homonym "kernel" for the military title "colonel." Yet the word "kernel" carries overtones of pit and pith in the sense of point or gist, essence or crux.